The issue has been a hot topic in the House of Commons in recent months. 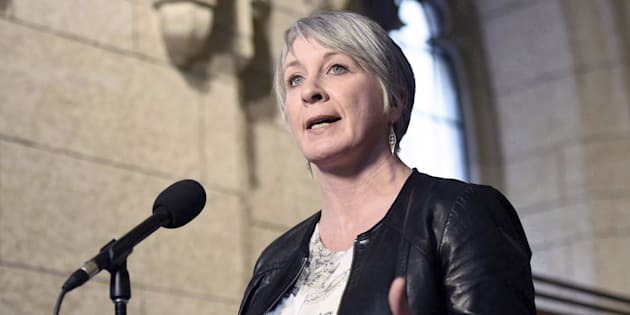 Minister of Employment, Workforce Development and Labour Patty Hajdu speaks to reporters during a weekend meeting of the national caucus on Parliament Hill in Ottawa on March 25, 2017. Canadians are evenly split when it comes to the federal government's controversial changes to its summer jobs program, according to a new poll. The Angus Reid Institute's survey asked respondents about the new attestation Liberals put in place for any group seeking public funding to hire students for summer jobs. The attestation asks applicant organizations to verify that they respect and support human rights and reproductive rights such as abortion. ARI's poll found 50 per cent of respondents supported this requirement while an equal number opposed it. The picture changes however, when participants are given two hypothetical scenarios to consider. The first example presented an organization morally opposed to abortion that would not use public funding for any kind of anti-abortion advocacy. Seventy-three per cent of respondents in this case agreed that the group should be eligible for public money. But in the second scenario, where a group that opposes a woman's right to choose uses public money for anti-abortion initiatives, just 37 per cent said it should receive summer job funding. The federal government said earlier this year that the attestation would ensure that public money does not fund groups or initiatives that aim to restrict a woman's right to choose. "Canadians expect us to be thoughtful about how we run programs and that we make sure that especially for these first jobs for kids, that they are with organizations that respect the fundamental rights of Canadians and don't ask them to do things that are essentially looking to undermine those rights," Employment Minister Patty Hajdu said in April. But the attestation has caused friction with several churches and other faith-based organizations that claim the government's requirement amounts to "coercion." "They foreclose the possibility of wide-ranging views and even healthy disagreement. The attestation remains unacceptable," the Canadian Conference of Catholic Bishops said in a statement earlier this year. Andrew Bennett, Canada's former religious freedom ambassador, also took issue with the requirement. "Whether you're a person of religious views or a person who just doesn't want to have an opinion, the government through this action is compelling belief," Bennett told The Canadian Press last week. "That has a certain totalitarian feel to it." Opinions over abortion, perhaps not surprisingly, heavily influenced the responses in ARI's poll. For example, 71 per cent of respondents who believe Canada should have laws that "severely restrict" abortion said groups that oppose a woman's right to choose should still receive public funding. Differences in opinion are also more apparent when responses are broken down across party lines. The majority of Liberal and NDP supporters in the poll said the attestation requirement was fair, while 68 per cent of Tory backers said disagreed. This largely mirrors how the House of Commons has reacted to the controversial rule, though some NDP and Liberal MPs have spoken out against it. In late January, NDP MP Nathan Cullen blasted the attestation and called it "dangerous," but he later apologized after party leader Jagmeet Singh reaffirmed the party's support for abortion rights. On the summer student program debate let me be clear: I apologize for the harm from my comments. I & the NDP are fiercely pro-choice. I reacted to concerns raised by groups in my riding on the gov'ts first statement on the policy. The subsequent examples put those fears to rest. In March, Liberal MP Scott Simms was the only member of his party to vote for a Conservative motion that called for non-political, non-activist groups to be eligible for funding even if they don't sign the attestation. He was later punished for it and lost his position as chairman of the Standing Committee on Fisheries and Oceans. That job came with a $11,900 salary bump. Veteran NDP MP David Christopherson was also briefly punished for voting in favour of the Tory motion. Singh removed Christopherson as vice-chair of the powerful procedure and House affairs committee, but reversed that decision after backlash from caucus. So far, of 42,708 applications to the summer jobs program, 1,559 were deemed ineligible because of the attestation requirement, according to a government answer to an order paper question tabled by Conservative MP Bob Zimmer. ARI's poll was conducted online survey between May 2-3, 2018 among a representative randomized sample of 1,512 Canadian adults. The polling firm said that, for comparison purposes only, a probability sample of this size would carry a margin of error of plus or minus 3 per cent, 19 times out of 20.